Soft elastic breathable material for maximum comfort. 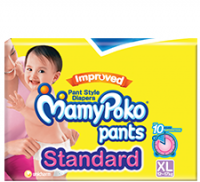 Ensure that your little one is smiling all through the day with the Mamy Poko pants standard medium size diapers. Featuring a quick-absorbent core, soft elastic band and comfortable leg gathers, these diaper pants are perfect for your active little angel. The soft elastic waistband of these Mamy Poko pants provide a comfortable fit so your baby can walk, run, play and jump around without any discomfort. Thanks to the soft breathable material of these diaper pants, your baby will feel dry, fresh and clean at all times. These Mamy Poko pants diapers are sure to protect your child from rashes, redness and itchiness. Long-lasting and leak-proof design. With a quick-absorbent core, these Mamy Poko pants standard are capable of absorbing up to four glasses of water, so you know your baby is going to be dry and cosy when sporting these diaper pants. You can easily pull up the diaper just like a normal pair of pants and tear off the sides for convenient removal of soiled pants. Designed with soft leg gathers, Mamy Poko pants medium prevent leakage so there are no messy baby clothes. These Mamy Poko pants therefore allow your little one to have uninterrupted play and sleep time every day. 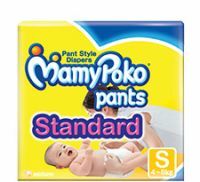 Buy these affordable Mamy Poko pants diapers to ensure that your baby remains comfortable and dry at all times. To Recieve updates and possible rewards for Mamy Poko Mamy Poko Pants Standard Pant Style Large Diapers please sign in. To Recieve updates and possible rewards for Diapers & Nappies please sign in.